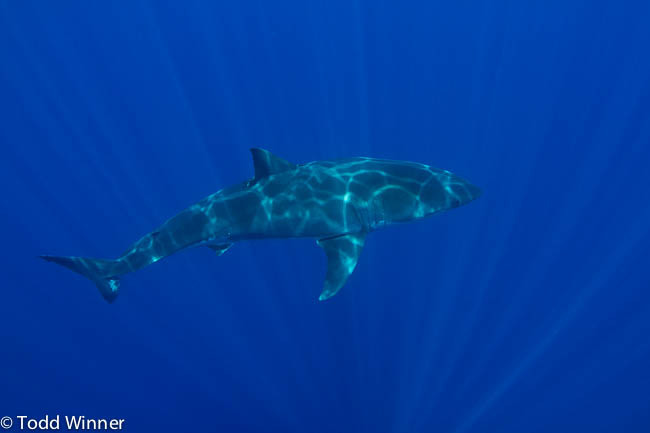 Todd shares his adventure of diving and underwater photography with Great White sharks aboard Nautilus Explorer. 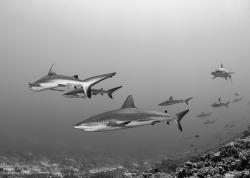 Whether you have just started shooting underwater images or have been shooting for decades, at some point most of us get the shark bug. 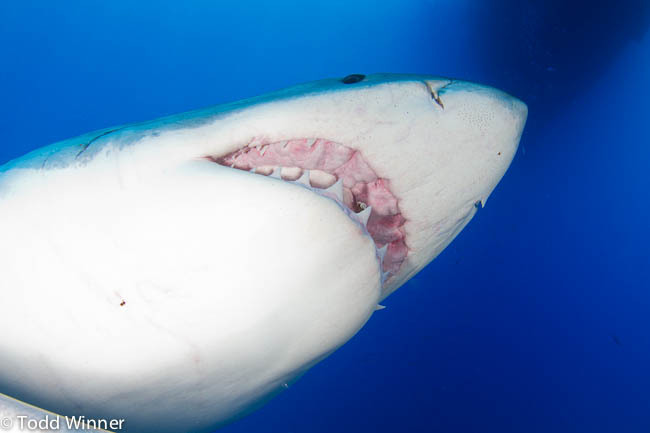 And if you want images of sharks, you probably want great white sharks. 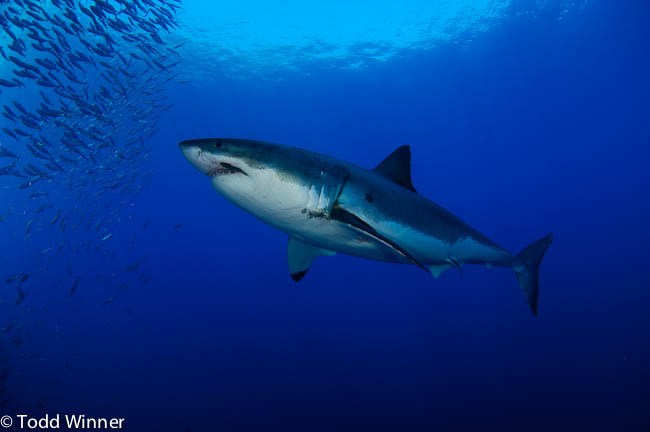 People just want to see images of great white sharks when you tell them you are an underwater photographer. 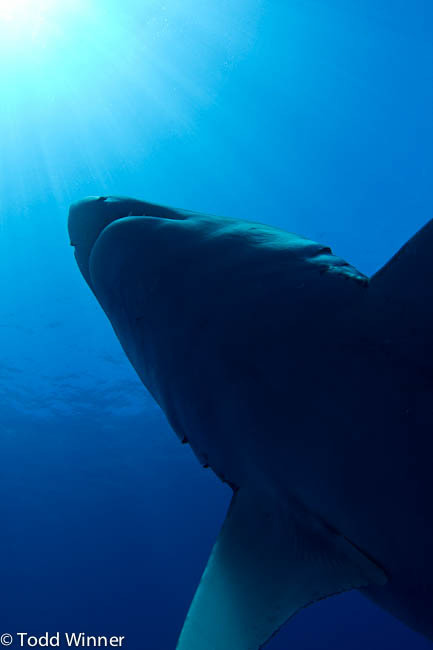 Besides pleasing your audience there is something awe inspiring about seeing a white shark up close and personal. They are just so much bigger and powerful than any other sharks you have seen before. 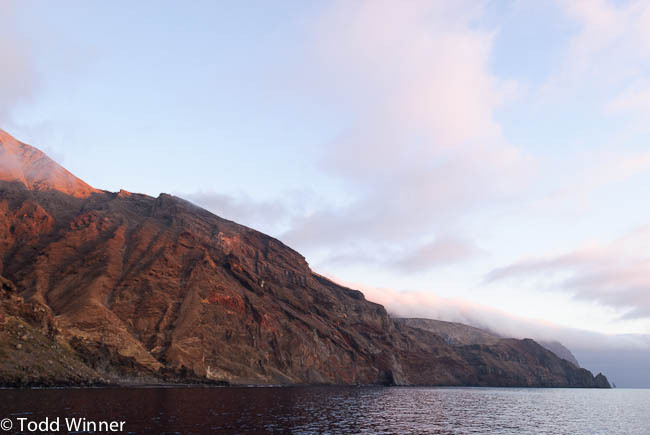 One of the best destinations to see these magnificent creatures is Guadalupe Island. Guadalupe Island, Mexico is a small volcanic island located in the Pacific about 150 miles off the west coast of Mexico’s Baja California peninsula. Canon 7D with Tokina 10-17mm FE lens. F6.3, 1/100th, ISO 160 @ 14mm. 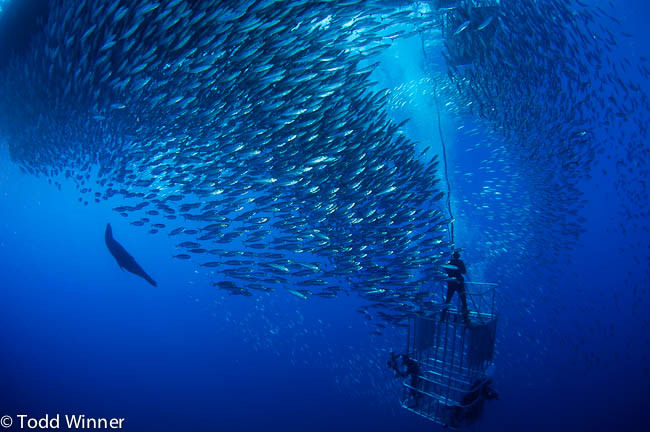 All the diving at Guadalupe is done from cages on surface supplied air. There are 2 cages that are tied to the stern of the ship, one at the surface and one 15 feet below the surface that are available for divers any time there is a open space. They both hold up to 3 divers at a time. They have 2 submersible cages off the sides of the stern, one that holds up to 4 divers and the other holds 2. They both drop down to 40 feet. 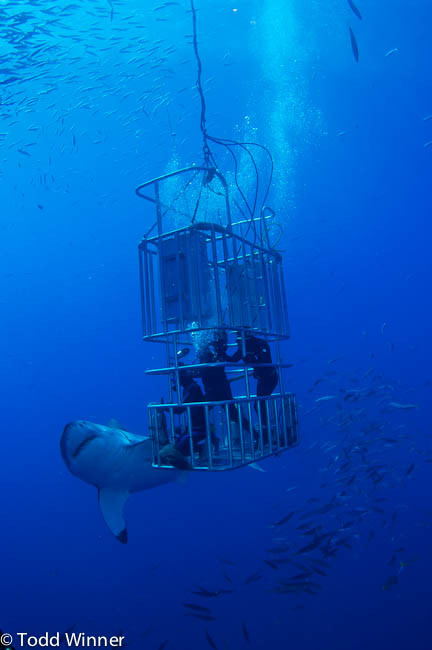 Depending on the conditions you can even get up on top of the cage for a more exciting dive. I found this not to be the best place for getting good images. The sharks just seem to spend more time down near the bottom of the cage. Also, if there are other divers in the cage, their exhaust bubbles can be a nuisance. There is also a lot of cables and hoses to contend with. Typically you will have the opportunity to make 3 or more submersible dives a day. Water temps are in the high 60's to low 70's with visibility up to 100 feet or better. I typically bring my dry suit (they have hoses so you can add some air to your suit at depth), but a 6mm or 7mm suit would also keep you warm. Since you are not swimming around you tend to get cold faster. Nikon D2x with Tokina 10-17mm FE lens. F8, 1/250th, ISO 200 @ 17mm. The most important thing at Guadalupe is being ready for the shot. Most of the images are ambient light shots with a little strobe to pop some color. I like to use manual camera and strobe settings but many photographers prefer to use aperture or shutter priority for this kind of shooting. Either way I suggest using a big memory card and shooting in a continuous shutter mode. A fast shutter speed will help freeze the action. Don't be afraid to turn your strobes off completely for some silhouettes and ambient shots. 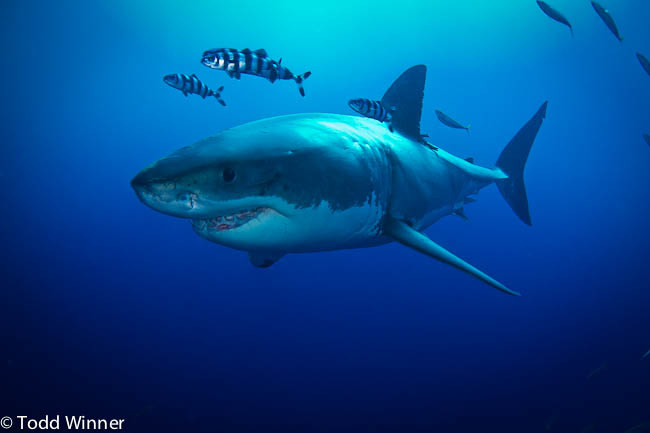 Diving with the white sharks in Guadalupe is an adrenaline filled adventure. I have made three trips with Nautilus Explorer and I hope to make some more. 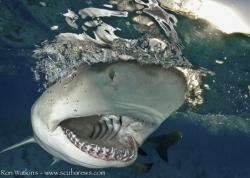 I am always amazed after seeing the white sharks up close, and I am sure you will be too. Nikon D2x with Tokina 10-17mm FE lens. F6.3, 1/125th, ISO 100 @ 10mm. Nikon D2x with Tokina 10-17mm FE lens. F8, 1/160th, ISO 200 @ 10mm. Canon 7D with Tokina 10-17mm FE lens. F7.1, 1/250th, ISO 320 @ 17mm. Canon 7D with Tokina 10-17mm FE lens. F6.3, 1/1000th, ISO 320 @ 17mm. Canon 7D with Tokina 10-17mm FE lens. F9, 1/125, ISO 320 @ 17mm. Nautilus Explorer is a 116' long, 27' wide steel ship. She has 9 staterooms below deck and 3 premium suites on the hot tub deck. The crew is top notch and there is always plenty to eat with up to four meals a day and snacks always baking in the kitchen. When you are done diving for the day they have an extensive collection of wines, beers, and spirits for purchase. Most Guadalupe trips are 5 nights long. It takes a day to get out to the island and a day to get back so that leaves 3 full days of diving with the white sharks. 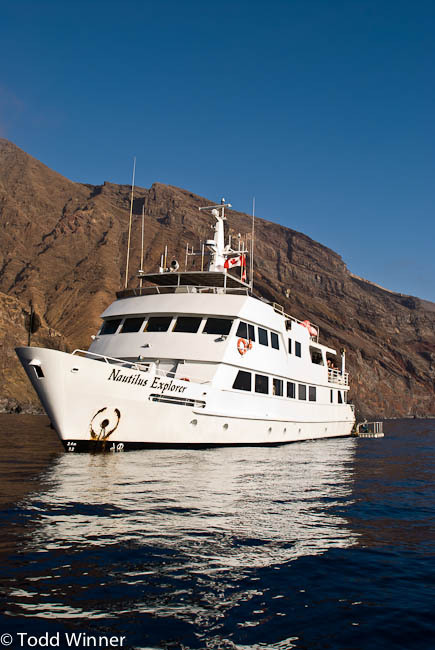 Nautilus Explorer at Guadalupe Island. Todd Winner is well-known for his amazing wide-angle underwater photography, and his book, Shipwrecks of Truk. 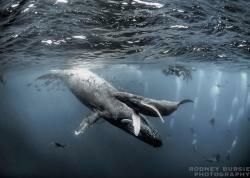 To see more of Todd's underwater photography, please visit his website at www.toddwinner.com.